Talandra’s Rose is one of those obscure herbs from back in Northrend / Wrath of the Lich King. Farming it is easy, since it’s only found in Zul’Drak. Not many people go out of their way to farm it though, because of where it’s located. Due to this, there are usually very few on the auction house at any given time. Players with inscription don’t seek this stuff out, instead they look for cheaper herbs that they can find in higher volume. Although most players leveling Alchemy will need 20 of it. Talandra’s Rose fluctuates from 2 gold each to 10 gold each, depending how much is available and who is leveling Alchemy or looking for it for another reason. You’re best bet is to sell it in stacks of 20, otherwise if no one else is posting you can crank the price up and sell it in stacks of 5. There is actually a little bit of intersting history behind this herb. Supposedly a developer’s ex-girlfriend had named all her characters after in-game herbs, except one whose name was Talandra. In order to complete the pattern Talandra’s Rose was added in Wrath of the Lich King. It would be interesting to know why it was only placed in Zul’Drak. Update: You can make a lot of gold with Talandra's Rose, but if you want to step it up and make thousands of gold you should read my personal favorite guide. The best place to farm Talandra’s Rose and the only place is in Zul’Drak. It’s not even found everywhere in Zul’Drak, just in south western part of the zone. 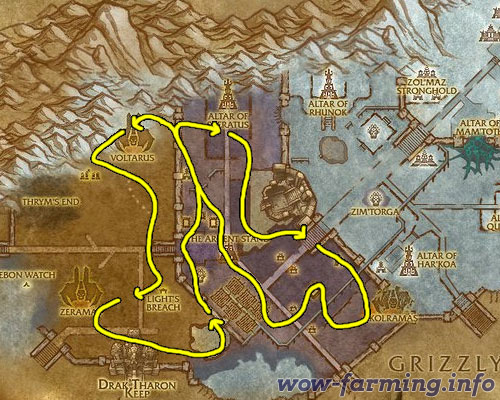 It’s also found in very specific places, this route covers every possible spawning point to a T. If you leave this path you’ll be farming other herbs and not find as much Rose.